As a scholar of literary journalism, I'm fascinated by borders. Those heavily policed edges of disciplines, which, though controversial, regularly inspire innovative and meaningful bodies of work. Literature and journalism share a famously contended border. So do journalism and science. The place where these three disciplines meet, however, is an under-charted territory. (1) I'm particularly interested in how the literary has been harnessed for science writing historically, and in what sort of journalistic platforms such innovation can thrive. As far as narratives go, few plots have been more valuable to publishers—of novels or newspapers— than the “exploratory voyage.” This was particularly true in the 19th century, when the mass press sponsored all kinds of exploration, from Henry Morton Stanley's search for David Livingstone in Africa to Frederick Cook and Robert Peary's race to the North Pole. These trips were more sport than science. But in the early 20th century, the emphasis shifted, away from easily sensationalized exploration-for-exploration’s-sake and towards scientific inquiry. The basic question driving my paper is: Did mass newspaper publishers continue to play a supporting role in scientific exploration, and if so, in what ways? The Graf Zeppelin made the seven-day round trip from Friedrichshafen, Germany, to the North Pole, carrying a group of scientists and explorers from Germany, the Soviet Union, Sweden, and the USA. The goals of the trip were threefold: to map the poorly charted Arctic areas, to take meteorological measurements, and to monitor the earth’s magnetic field in the Arctic region. What makes this particular trip interesting is that scientific inquiry was such an intentional goal. It didn’t have to be. 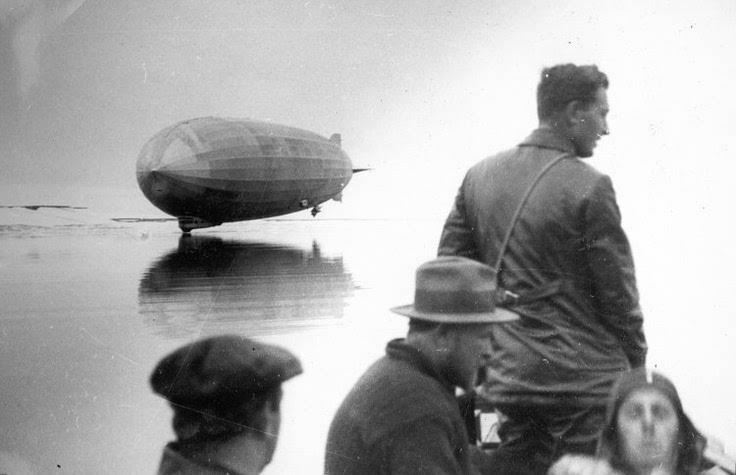 This was not the case for any other Zeppelin voyage, or for any other contemporaneous attempts to cross the Arctic by airplane, airship, or by boat. The flight alone would have attracted intense interest, for the Arctic was one of the few remaining unexplored corners of the earth. In fact, Hearst’s original vision for the voyage was a highly fantastic, less science-centered plan that involved the rendezvous of the Zeppelin with a submarine carrying Jules Verne’s grandson. When the polar retrofit of his decommissioned navy submarine proved impossible, Hearst abandoned the Arctic voyage altogether, leaving Ullstein Verlag to fill the gap. The Ullsteins bought the exclusive coverage rights, and placed on board the writer Arthur Koestler, then the science editor for the their flagship newspaper, the Vossische Zeitung. Based on my survey of the relevant clips from The New York Times and the Vossische Zeitung, Koestler delivered on his literary skills here too. (4) In addition to a great sense of drama and an eye for detail, Koestler put the science fully on display. He humanized the on-board professors and shared details of their experiments. Little was known about the weather conditions of the North Pole, whether magnetic or gyro compasses would work in the area, or how accurate existing maps actually were. Koestler provided context that allowed a lay reader to understand what was at stake in—for example— the otherwise unstimulating collection of data from atmospheric balloons. Koestler’s narrative also captured the utopian vision that drove the exploration— the sense that through human innovation all things are knowable. The lingering impact of this coverage, at least in Europe, was equally substantial. The expedition’s physician, Dr. Ludwig Kohl-Larsen, wrote a popular narrative account of the trip, in 1931, called Die Arktisfahrt des Graf Zeppelin (The Arctic Voyage of the Graf Zeppelin), which explained the science of the trip in much greater detail. And Koestler became an overnight celebrity. For months he gave speaking tours about the trip all over Europe, and upon his return was promoted to assistant editor-in-chief for the Ullstein’s largest paper, B.Z. am Mittag. Koestler’s own account of the Zeppelin tour, called Von weißen Nächten und roten Tagen (Of White Nights and Red Days), was published in 1933. I don't think it would be wrong to see in the Zeppelin the lingering shadow of the geopolitical ambition that drove the exploration of the Imperial era. Which leads me to the question whether scientifically motivated exploration is much different from the exploration of earlier centuries. As wildly successful as the Zeppelin’s scientific voyage had been, it remained a solitary enterprise. Economic crisis was in full swing by the early 1930s, closing newspapers and stripping funding for scientific research. The rise of the Nazi Party caused further disruption to the media and the scientific establishment. The Zeppelin was coopted as a political machine, and after the explosion of the Hindenburg in 1937, fell out of fashion completely, its full potential as a tool for scientific inquiry never to be fully realized. The partnership between the Ullstein Verlag and Koestler followed a similar course. The mass publisher took a risk by promoting a form of science writing that departed radically from the conventions of the day, with the best possible outcome. It seems that Koestler’s lyricism and poetic vision played an important role popularizing scientific discovery in Germany in the early 1930s. Koestler quit his position at Ullstein Verlag in 1932 to work for the Communist Party, an experience he creatively mined in his bestselling political novel, Darkness at Noon, published in 1940. He never returned to science journalism, although his postwar work takes up similar strategies and themes. His book-length studies, such as The Sleep Walkers (1955), are genre-bending works of speculative science that were simultaneously praised and denounced by scientific professionals. Going forward with this project, I hope to discern whether the pushback Koestler received was in response to his personal style, or if it signaled a discomfort with poetic science writing generally. One possible approach to addressing this issue was suggested by the research of another participant on my AJHA panel. Prof. Susan E. Swanberg of University of Arizona presented on The New York Times’ William L. ‘Atomic Bill’ Laurence, another popular and controversial mid-century science reporter who wrote outside the traditional boundaries of objective science writing. While Laurence and Koestler seem to have very different styles, a comparison of the reception of these writers’ works could provide insight into not only the strengths but also the limitations of the literary approach for science journalism. One of the most promising outcomes of the conference, for me, was the opportunity to meet Prof. Swanberg and discuss possible collaboration in the future. (1) See Andreas W. Daum, “Varieties of Popular Science and the Transformations of Public Knowledge. Some Historical Reflections,” Isis 2009 v. 100: 319-332. (2) My account of the voyage has been pieced together from first-hand accounts, Arthur Koestler, Von weißen Nächten und roten Tagen (Vienna: Promedia Verlag, 2013), and Ludwig Kohl-Larsen, Die Arktisfahrt des “Graf Zeppelin” (Berlin: Union Deutsche Verlagsgesellschaft, 1931) and from secondary sources, Michael Scammell, Koestler: The Literary and Political Odyssey of a Twentieth-Century Critic (New York: Random House, 2009) and Guillaume De Syon, Zeppelin! Germany and the Airship, 1900-1939 (Baltimore: Johns Hopkins Press, 2002). (3) Arthur Koestler, Arrow in the Blue (London: Hutchinson, 1969), 284. (4) The New York Times ran 13 articles and Vossische Zeitung ran 16 articles during 24-31 July 1931. All Vossische Zeitung articles were written by Koestler. The New York Times coverage was a mix of Koestler’s reports in translation and in-house commentary. (5) “An Aerial Contrast,” The New York Times, 31 July 1931, 16. (6) De Syon, Zeppelin!, 168. (7) Koestler, Arrow in the Blue, 284. Kate McQueen is a master’s degree student in journalism at Illinois, where she is studying literary journalism, and an instructor in Illinois’ Osher Lifelong Learning Institute. She holds a Ph.D. in German Studies from Stanford University, where she specialized in Central European literary and press history. The Irish Bibliography of Press History (IBPH) is a searchable, open access resource. It can be accessed at http://newspapersperiodicals.org/bibliography/. The scope of the IBPH is to provide a bibliography of secondary literature on the history of print media in Ireland, or by scholars based in, or closely associated with, Ireland on the history of print media generally. Updated three times a year (January, May, September) it is primarily focussed on published scholarly, academic work. Having just passed its first brthday the IBPH now contains over 1,000 individual entries and continues to grow as new works are added. Suggestions for forthcoming publications that should be included or previously published works that have been accidentally omitted are most gratefully received, contact details are available on the IBPH page. Thought is being given to how the IBPH can be improved and developed. To assist this process it would be greatly apprecaited if anyone with an interest in, or who has previously used, the IBPH could provide some brief feedback (only five short questions) via this survey https://www.surveymonkey.com/r/BBLMB3N. The IBPH is an initiative of the Newspaper and Periodical History Forum of Ireland (NPHFI). The Eugenia M. Palmegiano Prize in the History of Journalism will be awarded again at the 2018 convention of the American Historical Association (AHA), to be held January 4-7, in Washington, D.C. The Palmegiano Prize is awarded annually to the author of the most outstanding book published in English on any aspect of the history of journalism, concerning any area of the world, and any period. Books that focus on the recent past should have a significant historical component. Books that deal with journalism in relation to other forms of mass communication are eligible for consideration. Books with a copyright of 2016 are eligible for the 2017 award. One copy of each entry must be sent to each committee member and clearly labeled “Palmegiano Prize Entry.” Electronic copies may be sent only to committee members who have indicated they will accept them. Entries must be received by May 15, 2017, to be eligible for the 2017 competition. Entries will not be returned. Recipients will be announced on the AHA website in October 2017 and recognized during a ceremony at the January 2018 AHA annual meeting in Washington, D.C.
Other specific submission instructions will be posted on the AHA website on or before March 31, 2017, according to that website. This Intelligencer post also will be updated when that information is available. AJHA fulfills a unique role for many of us, encouraging our ongoing and future research, supporting our teaching and generally connecting us to each other across campuses (and associations!). We have strong ties to AEJMC’s and ICA’s History Divisions. But in order to grow and remain strong, we need to recruit and retain graduate students and junior faculty in journalism, media studies and communication departments across the country and world. 1) Getting early-stage graduate students to older colleagues offers immense opportunities for emotional and mental support during the long dissertation stage. Media history is hard. It involves deep dives into primary sources, balancing expectations from committee members who might have backgrounds as diverse as traditional history, sociology, communication studies and journalism, and teaching. 2) Connections with fellow graduate students, newer faculty and more established faculty can lead directly to great new ideas for teaching and course development. 3) Meeting other media-history scholars can spark collaboration across continents and disciplines. Need help tackling a long-term project? AJHA might be just the place to get pointers for how to make the best use of archives and other sources. 4) AJHA helps you get a foothold in the academic world, experiencing the norms and give-and-take of a conference, and learn how to make the most of feedback from peers. 6) AJHA’s practice of only holding two sessions at a time means participants have an audience of engaged peers and senior scholars at their session, no matter what time it’s held. 7) AJHA’s history tour provides participants with an opportunity to learn about new places while also relaxing with fellow scholars. 8) Feedback that you get at AJHA can help presenters move an article to publication, which helps graduate students get competitive jobs. 9) AJHA has several committees that provide graduate students with an opportunity to get involved, network with other scholars, and put a national service line on their CV. AJHA’s size means that there are several opportunities to participate in various roles. 10) On a less serious note, the food at AJHA is amazing. The conference organizers always make sure that attendees are well-fed and caffeinated throughout the day. Food is an important draw for both grad students and fulltime faculty. Please ask a grad student in your life, or a colleague in your department, or allied department, to consider visiting AJHA’s next conference and then joining it. It’s up to all of us to find great new colleagues for the future of our fine organization. Let’s get to it! If you have questions or suggestions for the membership committee, please email Kate at edenborgk@uwstout.edu, Candi at candi.carterolson@usu.edu or Will Mari at william.mari@northwestu.edu. AJHA’s fifth annual convention was pivotal for the young organization. Preeminent scholars Walter Ong and James Carey delivered speeches, the women’s luncheon became institutionalized, and the organization presented the first distinguished service award to its eventual namesake, Sidney Kobre. Maurine Beasley, who served on the Board of Directors at the time, remarked on the outstanding intellectual content of the 1986 St. Louis convention. “It marked AJHA really coming of age in the academy by drawing in leading figures as speakers and inspirations to all of us,” Beasley said. Michael Murray was president of AJHA in 1986 and chief organizer of the St. Louis convention. Murray cited Ong as a major influence during his undergraduate and master’s programs at St. Louis University, and he thought members would enjoy hearing Ong speak. 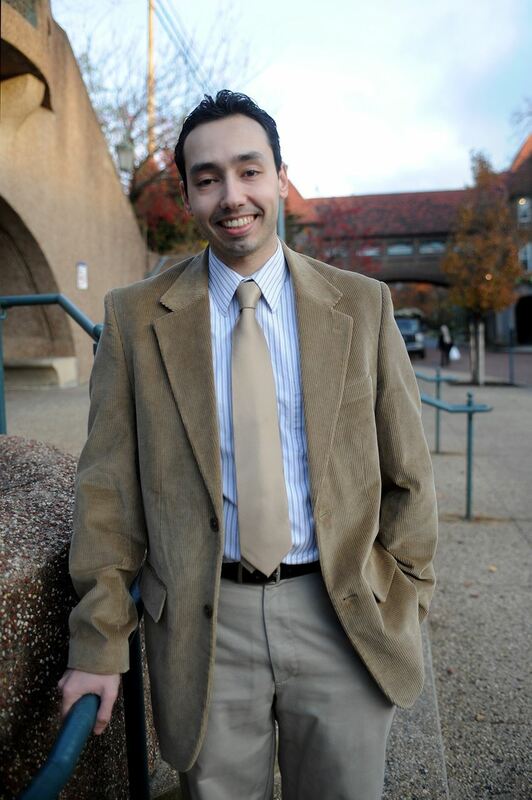 Then-board member John Pauly had been Carey’s student at the University of Illinois and suggested inviting him. Murray transported Ong to the Clarion Hotel, where the conference took place. “Once we got to the hotel, it appeared that everyone attending the meeting was right there in that conference room, packed to the rafters,” Murray said. Beasley said that the two speakers were part of AJHA’s drive to bring fresh ideas into journalism history. “It was an extremely scholarly speech—mind expanding and provocative, moving us beyond the usual consideration of the roles played by outstanding figures in journalism history,” Beasley said of Ong’s address. Alf Pratte summarized Carey’s talk in the Winter 1986/87 Intelligencer. Carey told the group that modern journalism disrupts collective memory by stressing speed over meaning and called upon journalists to encourage oral culture in everyday communities. Convention attendees also heard from James Lawrence, long-time editorial page editor of the St. Louis Post-Dispatch. Murray initially invited Joseph Pulitzer Jr., but Pulitzer suggested Lawrence could provide better insights on local journalism history. Lawrence began working for Pulitzer Publishing in 1938 under Pulitzer’s father, Joseph Pulitzer II. Another highlight of the convention was the presentation of the first distinguished service award at the Old Courthouse—site of the Dred Scott trials. AJHA co-founder David Sloan suggested presenting the new award to Kobre because of his impressive scholarly resumé in history and commitment to AJHA since its beginnings. “There was so much to learn from him, for he had an encyclopedic knowledge of the history of the press,” Startt said. Upon receiving the award, Kobre delivered remarks drawing parallels between the journalist and historian. According to an article in the Winter 1986/87 Intelligencer, Kobre also discussed the benefits of studying media history and emphasized the importance of AJHA to create a network among journalism historians. 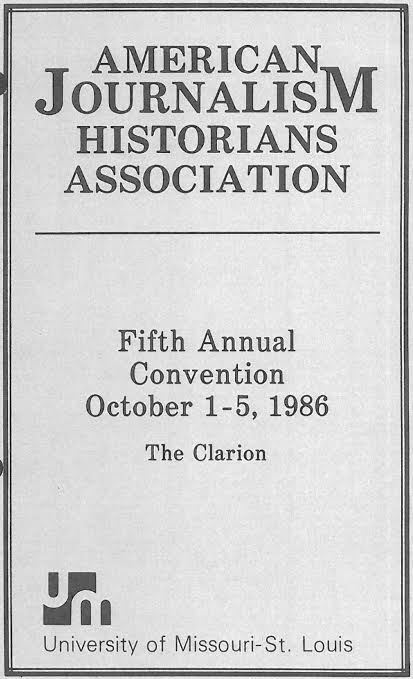 In the early days of the organization, AJHA provided a venue specifically for women historians to network. The Women’s Lunch—the precursor of the Donna Allen Luncheon—first appeared on the program as an official event in 1986. Beasley said that Barbara Cloud, AJHA president in 1984-85, began the lunch because the men typically went off by themselves to have meals at conventions and did not invite the women. Beasley noted that the men resented the formal listing of a luncheon for women, so the Donna Allen Lunch eventually was open to all convention attendees. Paulette Kilmer counts the Women’s Lunch among her favorite memories from her first AJHA convention—in 1986. She met Beasley as she was heading out for the luncheon and tagged along. Carol Sue Humphrey also attended her first AJHA convention in 1986, and she said her fantastic experience there was why she fell in love with the organization. She said she enjoyed the combination of research and a field trip—the group visited the St. Louis Arch. For the full 1986 convention program, visit ajha.wildapricot.org/past-conventions. It recently has been digitized as part of an effort to electronically preserve all of the convention programs. 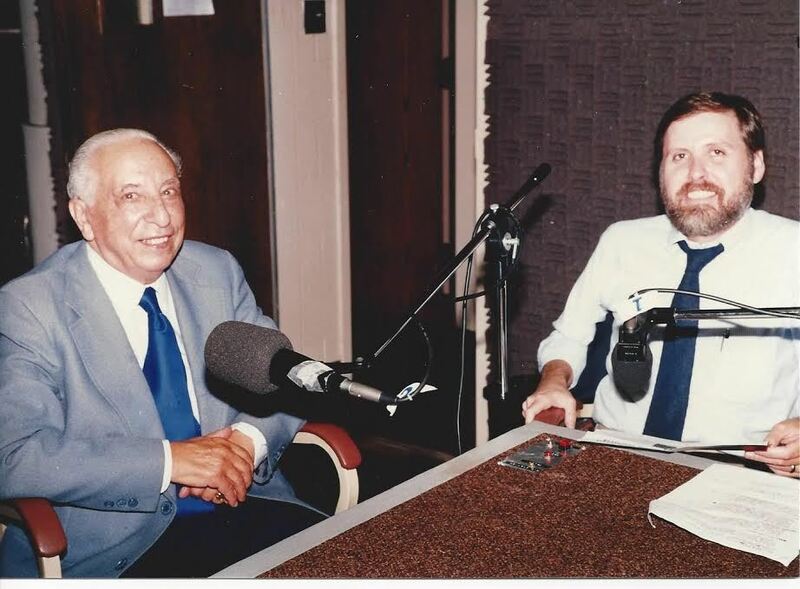 We continue our series examining members’ oral history projects with this feature from Nicholas Hirshon, an assistant professor in the Communication Department at William Paterson University. A former reporter for the New York Daily News, Hirshon has written two books of sports history, Images of America: Nassau Veterans Memorial Coliseum (2010), about the former arena of the NHL’s New York Islanders, and Images of America: Forest Hills (2013), about the neighborhood that long hosted the U.S. Open. His email is hirshonn@wpunj.edu. There are many historic markers in New York City, but not in the neighborhood where I’m from. I grew up in the middle-class suburb of Forest Hills, Queens, which is a long haul on the bus and the subway to the tourist-teeming landmarks of Manhattan. Forest Hills has history, but it cannot compete with the likes of the Empire State Building and the Statue of Liberty. Too often, its past is forgotten altogether. This irks me as a historian. I have devoted much of my research to shedding light on the rich past of my hometown, where few scholars tread. And I could not do it without oral history. At the annual AJHA conference in October, I presented a research-in-progress on a sports television program with a Forest Hills connection. I grew interested in the topic several years ago when I was working as a newspaper reporter and covered the closing of a bowling alley near my boyhood home. I learned that the alley had hosted a short-lived NBC game show named Phillies Jackpot Bowling in 1959 and 1960. The program had a pioneering format in which professional bowlers competed for tens of thousands of dollars by attempting to bowl six consecutive strikes in nine tries. Phillies Jackpot Bowling was instrumental in raising interest in bowling across the United States and precipitating an era when top bowlers earned more than many baseball and football stars, a dynamic that is unthinkable in the modern sports landscape. After I transitioned from practicing journalism to teaching and researching it, I wanted to examine the history of Phillies Jackpot Bowling. The problem was the lack of sources. No clips from the show seem to have made their way online, and only one episode has survived, available only for on-site viewing at an archive in California, thousands of miles away. None of the people involved in the show left an archive. Reports in newspapers and magazines offer an incomplete picture of events. Oral history proved fruitful to fill in the gap on previous projects. But Phillies Jackpot Bowling went off the air more than half a century ago. I figured everyone involved in the show had died long ago. Not true. To my surprise, I was able to track down and interview four bowlers who appeared on the show. Their vivid memories of the program provided much-needed color and made possible my tribute to my hometown’s history. Today the bowling alley is no more. The alley was renovated into a furniture store when I was still a reporter, and I wrote articles advocating for a historical marker nearby. The owner agreed and put up two plaques, one on the façade and another inside with a display of bowling memorabilia. Now it’s up to me – and oral history – to put the plaque in context. Do you have an oral history project you would like featured in the newsletter? Email Teri Finneman at finnemte@gmail.com. Volume 3, Issue 1 of Historiography in Mass Communication was posted at http://history-jmc.com/Home.html in early January.